BORDEAUX winger Malcom’s agent hinted a January Premier League transfer could be underway after sharing a snap of himself in London. Leonardo Cornacini of Elenko Sports – an agency representing the Brazilian – posted a picture to Facebook of himself in the capital. It was a “teasing picture”. And the teasing caption to the photo? And..? And nothing. 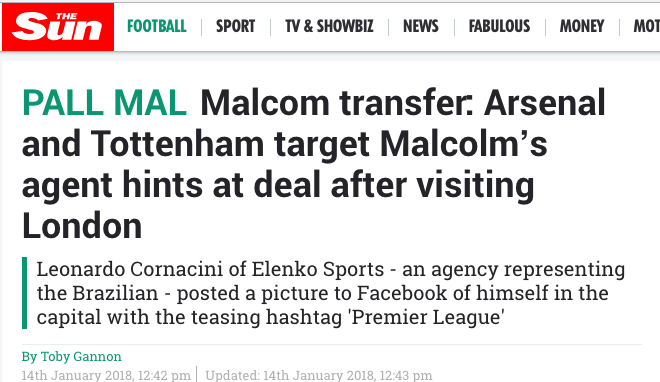 Undaunted by the lack of news in this scoop, the Sun added: “One social media user asked: “Does it have anything to do with Malcom to Arsenal?” And the response from Cornacini? Nothing. But he did go to the Albert Hall to watch a show. Over in the London Evening Standard the story went: “Tottenham and Arsenal target Malcom reveals Premier League dream.” And, indeed, Malcolm did say last January: “It is true that England is a dream for every player.” That was a rare moment of fact. Although he never mentioned a club. 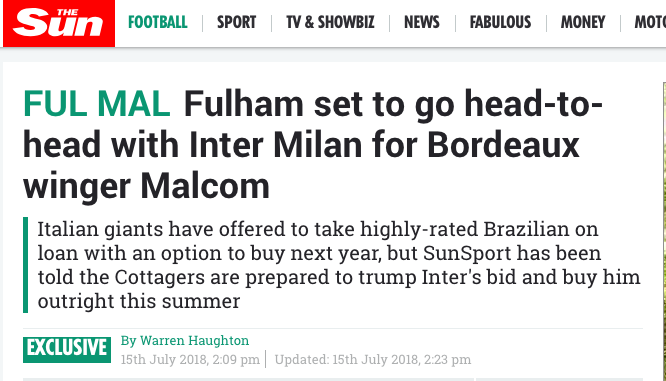 And then the Sun said Malcolm was off to…Fulham or Inter Milan.